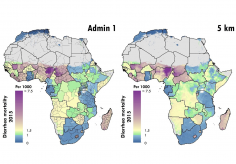 Explore local patterns of diarrhea burden across Africa from 2000 to 2015 with this interactive visualization tool. 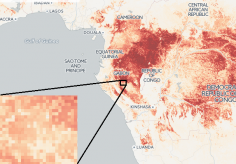 Compare diarrheal prevalence, incidence, and mortality at multiple spatial scales – from values at the country level to estimates at a 5-by-5 kilometer granularity. Search for specific countries, districts, and local areas to view trends, and share your findings with others. Observe temporal patterns of improvement, and examine the probability of achieving the WHO Global Action Plan for Pneumonia and Diarrhoea (GAPPD) goals.